Fans of the silent screen agree that silence is golden. There was something special when silent films were the universal language and when Gloria Swanson (as Norma Desmond) said, “We didn’t need dialogue, we had faces!” During the writing of Broken Silence, I wanted my subjects, who were among the last of the silent film stars, to be anything but silent. 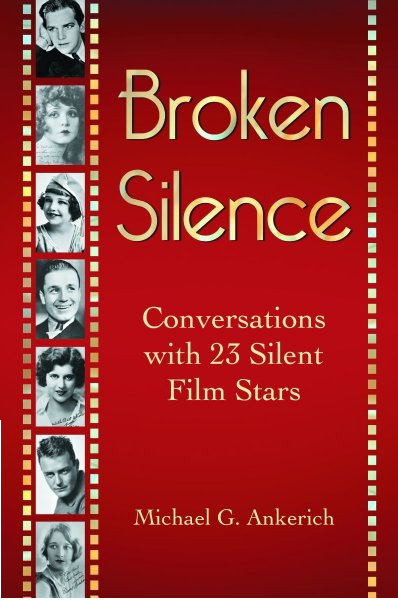 Broken Silence features my exclusive interviews with the following: Lew Ayres, William Bakewell, Lina Basquette, Madge Bellamy, Eleanor Boardman, Ethlyne Clair, Junior Coghlan, Joyce Compton, Douglas Fairbanks Jr., Maxine Elliott Hicks, Dorothy Janis, George Lewis, Marion Mack, Patsy Ruth Miller, Lois Moran, Baby Marie Osborne, Muriel Ostriche, Eddie Quillan, Esther Ralston, Dorothy Revier, David Rollins, and Gladys Walton. Throughout the research, interviews, and writing of Broken Silence, my primary mission was to collect and publish the memories of silent film players before the passage of time silenced their recollections forever. Before the manuscript was complete, Madge Bellamy, Lois Moran, Eddie Quillan, and Marion Mack were gone. Since several (George Lewis, Gladys Walton, Dorothy Janis, Maxine Elliott Hicks, David Rollins, for example) had never spoken extensively about their careers, I wanted to thoroughly document their Hollywood experiences and recount their impressions of their work, other actors and their directors. They talked about the circumstances under which they entered films, the direction their personal lives took and how being in the picture business affected the rest of their lives. I sat by the bedside of Eleanor Boardman as she reminisced one afternoon in her Santa Barbara home about friends Greta Garbo and John Gilbert and her messy divorce from director King Vidor. She had lived in castles, in Beverly Hills spendor, and, for a time, at William R. Hearst’s spread in San Simeon. Now, at almost 90, her world was confined to her bedroom and adjoining courtyard. Maxine Elliott Hicks and I had breakfast a couple of times at a pancake house in Glendale. Her film career spanned from 1914 to the present. She spoke of working with Wallace Reid, Ethel Barrymore, and Mary Pickford. When I asked her about the William Desmond Taylor murder case, she looked from side to side to make sure that no diners in nearby booths were eavesdropping, lowered her voice, and leaned forward to whisper her opinion, as if the scandal had happened only yesterday. Dorothy Revier told about a cruel practical joke Agnes Ayres played on her on the set of her first talkie. In two rare interviews, Dorothy Janis talked about working with cowboys Fred Thomson and Tim McCoy and about traveling to Tahiti with Ramon Novarro to film The Pagan (1929). George Lewis, a veteran of over 100 films, spoke of working with Jean Hersholt, Pauline Frederick, and Rudolph Schildkraut in the silent era, before continuing a successful career in Westerns and serials in the talkies. From her waterfront home in Morro Bay, Gladys Walton, who in 1923 walked out of her studio contract a star, talked of Theda Bara, Lon Chaney, and Rudolph Valentino, and recounted an incident that barred her from ever being invited to the Hearst Castle. Madge Bellamy’s interview in Broken Silence turned out to be her last. During our over three-hour conversation, she talked frankly about her career and her 80-year struggle to understand what she called the “stranger” inside her that practically ruined her Hollywood career. The silent film greats were anything but quiet when we talked; they had plenty to say.